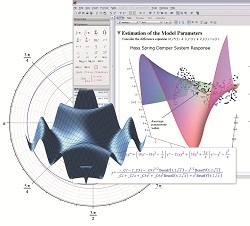 A MAJOR update of Maple, the technical computing software for mathematicians, engineers and scientists, has made the program easier to use and more powerful, says distributor Adept Scientific. Maple 16 introduces new tools and techniques in its Clickable Math collection, such as the ‘drag-to-solve’ function which enables users to solve equations simply by dragging individual terms. Smart Popups instantly show mathematical identities, plots, factorisations and more for the highlighted expression, helping the user choose the next operation to perform. Other changes in Maple 16 include improvements in mathematical algorithms, programming language, visualisation, documentation, and engineering and authoring tools. Altogether more than 100 new mathematical applications deliver new insight in maths, statistics, physics, and finance. “This release sets a new standard in maths software usability, offering everything from intuitive point-and-click tools to a sophisticated programming language, so users can take advantage of over 5000 mathematical functions in Maple 16”, says Dr Laurent Bernardin, executive vice-president and chief scientist at Maplesoft.